It doesn’t matter if your trailer is big or small, there are everyday safety steps that should be taken to avoid tragedies while on the road. 1. Stay up-to-date on regular maintenance. As well as the trailer, the vehicle doing the towing should be properly maintained since towing puts additional stress on the tow vehicle. 2. 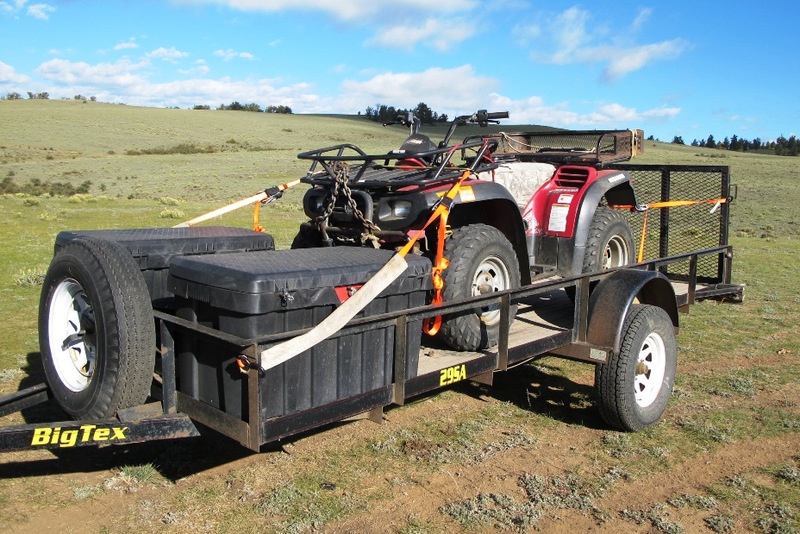 Correctly attach the trailer to the tow vehicle. The trailer should be snugly set on the tow ball and secured with the trailer latch. 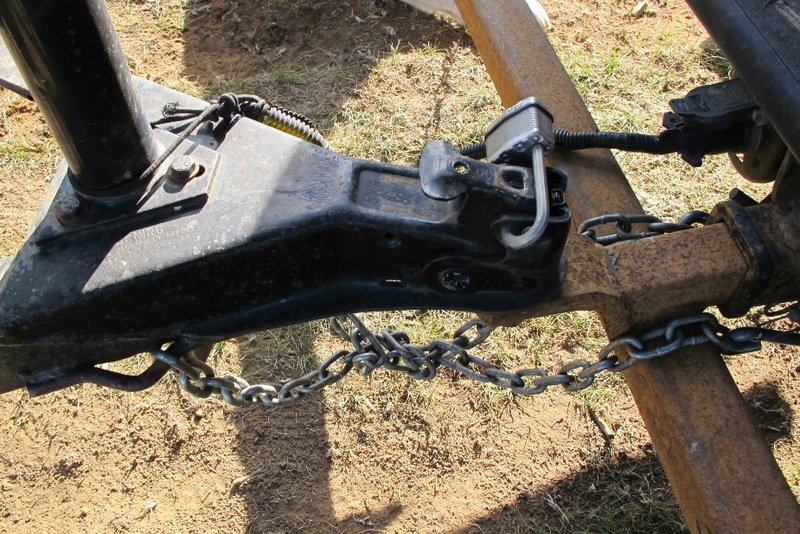 The safety chains should be crisscrossed between the trailer and the tow vehicle, and connected to the ball mount with enough slack to make turns, but not to drag on the road surface. The breakaway system lanyard should be connected to the tow vehicle but not to the safety chains or ball mount. Make sure all running lights, tail lights, brake lights, turn signals, and hazard lights are connected and working. 3. Make sure your weight is properly distributed. When loading the trailer, be sure you have proper weight distribution from left to right, and front to back. A properly balanced trailer reduces the overall wear on the tow vehicle and the trailer. Do not overload your trailer beyond its maximum capacity load (or else something like this can happen). About 60% of the load should be placed in the front half of the trailer so that the tongue weight of the trailer hitch is about 10% of the total weight. The trailer tongue should sit about level with the tow hitch; not tilted up or downward. The load should be evenly divided between the left and right sides, and then secured so that it doesn’t shift during transport. 4. Do a 360 walk-around before you take off. Before any driving, do a full visual inspection of the trailer and tow vehicle from all angles to be sure that everything is secure, functioning, and ready for the road. Make sure your trailer jack and stabilizers are up and locked in place. Ensure that items in the trailer are securely fastened and that any straps are tight and the ends tucked away securely. Make sure you have your wheel chocks and jack stands. Ensure you have good visibility in your tow vehicle mirrors. Keeping trailer safety in mind every time you tow can help prevent dangerous and costly accidents, as well as unwanted wear and tear on your rig. Thanks for the advice to make sure all lights, including brake lights, turn signals, and hazard lights are working before taking a trailer on a trip. I was excited to purchase a used trailer online that I could use for camping this summer, but I’m pretty sure the lights aren’t working. After getting new trailer lights, I’ll be sure to check them regularly in order to ensure my trailer is safe and in working condition. After towing four different travel trailers and fourty years of it you experience a lot of does and don’ts. I can tell you I’ve seen serious accidents which could have been prevented if only safety checks were followed. For you and yours never ever, neglect your equipment including your tow vehicle. I agree and confirm Larry Weaver recommendations. I’ve been thinking of getting a trailer to haul stuff around in, so I appreciated the tips you gave on trailer safety. My favorite part was how you took the time to stress the importance of regular maintenance to ensure safety when towing. I’ll make sure my trailer gets inspected regularly if I get one since I want to make sure I stay safe. I purchased a used tow dolly with electric brakes. Seller said he never used brakes. When I hooked up dolly to my motor home brakes pulsed when signal lights were on, night lights caused lockup. Harness was wire wrong. Little wonder he didn’t use brakes!!! I had a near disaster mishap because of a cheap hitch pin that broke! Wish I’d seen this before! I now have a much sturdier pin but my hitch did come loose and the chains saved me and my teardrop camper from damage. The front toolbox had some damage but I was very lucky. Get a sturdy locking hitch pin! I watched the video about the crash and noticed the rear steps were extended. wondering if he bumped the steps into the truck to start the swaying. Always do a final walk around and make sure everything is locked and put where it should be for traveling. I have also been advised by state highway patrol to not leave the security lock on the hitch mechanism when on the road but to use a pin that can be removed in the case of an accident where emergency staff can remove the trailer form the tow vehicle if necessary. Wow! Thanks for that tip. Didn’t even consider that. From 2 of the display pictures the safety chains were twisted to shorten them, which will reduce the chains ability to work properly. Take 20 minutes a and a couple of wrenches and shorten the chains to the proper length. To show these pictures endorses this use as being acceptable. In my home province if you were to be pulled over by authorities you would be subjected to a ticket for this infraction. All of your written comments are right on . People go by what they SEE. Why cross the chains? I do it because it was said to me in the PI, I but why? The X that the crossed chains form is a cradle for the hitch if it comes loose, keeping the hitch off the road and allowing you to safely stop. I had no idea that crossing the chains was for this purpose…thank you! I didn’t have them crossed when my boat trailer jumped off the ball and the chains let the hitch hit the ground but did stop the front of the boat from hitting the back of my truck. So I am going to cross them from now on! Keep in mind that if you have electric brakes and a breakaway cable, which is designed to close a switch if the trailer becomes disconnected while going down the road, you MUST have battery power on the trailer in order for the brakes to be activated by the breakaway cable since there will no longer be any power from the towing vehicle since the cable from the towing vehicle and the trailer will be pulled free by the errant trailer.